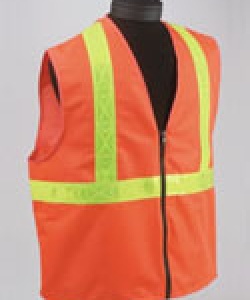 S17P ANSI Class II With Pockets Vest 100% polyester knit. 2" retroreflective trim, Labeled to conform to ANSI/SEA 107-1999 standards for design and reflectivity. Color matched zipper closure. Independently tested to withstand 50 washing (highest was limit in industry). Machine wash, warm, do not bleach, tumble dry low permanent press, do not iron, do not dry clean. Pockets are sewn inside of vest. Right pocket meaures 9" L x 7" W. Left pocket meaasures 9" L x 7" W (with 2" wide pencil divide).